Shown here is a tops down view that displays the four shaped sectional dishes set in the base tray. 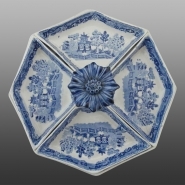 This five-piece octagonal shaped earthenware condiment or pickle dish stand with beautifully molded floral handle is printed in blue with the Standard Willow pattern. The molded handle is painted in a light and dark blue ground. Four shaped sectional dishes sit in the base tray. This example is attributed to Bathwell and Goodfellow based on a marked piece in an identical shape printed in another pattern.